was produced in Gaul and was much sought after. We have made up a simple Student Dig Report form for you and your students to use as you wish. a) that you "bury" all the items for the students to "excavate". Copious instructions and suggestions as to the items which you could use are all in the Archaeological Simulation section at www.ancientcoinsforeducation.org. b) However, some have chosen to let the students also take part in the "burying" of the artifacts, with one class or group "burying" and the other "excavating". In this case the Official Site Guards should come from the "burying" crew (more later about these). 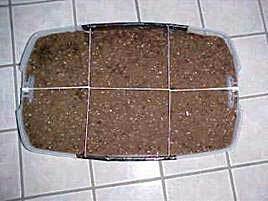 A simple indoor dig can be made using a large plastic box, say, 18 in. x 24 in. and 6 in. deep. Here is a very simple, easily portable example showing the grid. Unfortunately the background is square floor tiles,so don’t be confused by that. To create a deeper stratified dig indoors, choose a deep, preferably transparent sided storage container, and put multiple (maybe three) levels in it - starting perhaps with some rounded pebbles, bits of stone, and gravel at the bottom, then a layer of pale sand, with soil on top. You can also include a layer of ash to indicate a settlement that burned. 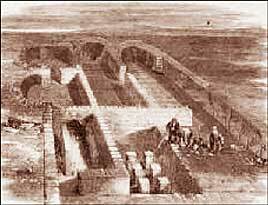 The site of the dig, be it boxed indoors or outdoors, should be laid out so that a grid of squares is made covering the area to be excavated. Each square of the grid has a reference number, and the job of the excavation team is not only to carefully uncover the artifacts, but also to record where each was found, and, if your dig is deep, at which level or stratum the object was found. If you have made your dig in an enclosure outside with wood edges, fasten the string which separates the various squares of the grid securely. If you are doing it inside using large plastic containers, you can tape the ends of the string grid to the edges of your box. Items to have available include ... trowels ( i.e. metal spoons ) for digging, gloves for your "personnel," boxes for separating and storing artifacts which will appear, a sieve for removing loose earth. 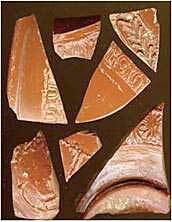 A couple of bowls of water should be available for rinsing the artifacts and some old towels or paper towels for drying them and cleaning up. If you are doing it indoors on a table, spread a drop cloth on the table first - it can be messy! Contents of your dig These are fully described at the site mentioned above, but by all means use your imagination while keeping it within the historical context. So just a few reminders . . . 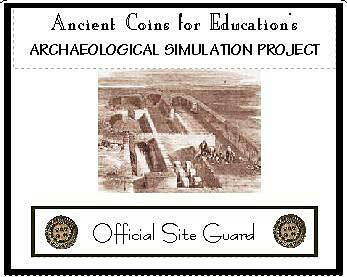 Since we hope that you are allowing your students to keep the coin they "excavate," it is a good idea to appoint an "Official Site Guard" or two from your class, with a badge announcing the role. The Guards get "paid" for their roles in guarding the sites. It is their job to make sure that no one takes more than their allotted one coin. For this they receive a genuine Roman coin with probably a votive reverse. Your students should dig carefully with their spoons removing the earth into an earth container, which later can be sieved for any missed items. As they come across artifacts, they should label them with an individual consecutive ID number and the grid section in which they found the objects. Then they should note the finds methodically in columns or on separate sheets per grid square giving a description of the item and the initials of the person who found it. They should do a rough drawing of the item or take a photograph of it, then store it in the finds boxes. In A1, layer one (the top layer - 2 ins from the surface) we found . 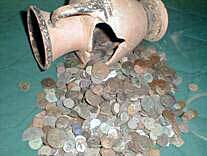 . .
1) Roughly date the coins - are they all from the same period, or did ancient Romans live at your site for several hundred years? 3) Are there signs of trading - through imported items which would not have been available naturally at your site? 5) Try and re-assemble your "ancient" broken pot.